In the 1960s and ‘70s, marketers at B2B companies invested heavily in traditional advertising to generate awareness and ultimately gain customers. In the early ‘90s and the late ‘00s, businesses began building strong online footprints through email, websites, and social media. But successful marketing strategies of the future will rely less on digital experiences, and more on live events. This trend can already be seen today. 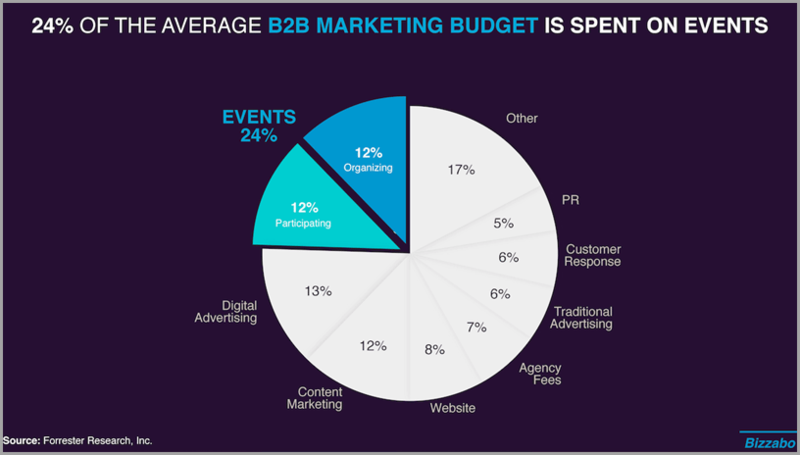 According to Forrester Research, the average B2B CMO spends 24% of their budget on events. Live events account for the single largest marketing category, larger even than content marketing, digital advertising or website development. 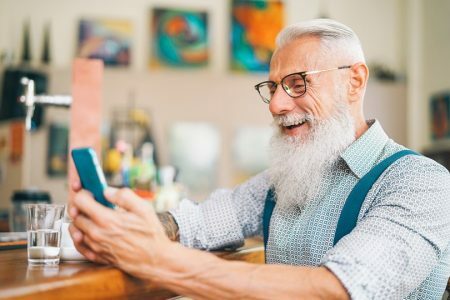 The reason for this is that some savvy marketing leaders understand that live events provide marketers with a unique opportunity to connect with target audiences – something that is becoming harder and harder to do as prospects become shrewder. 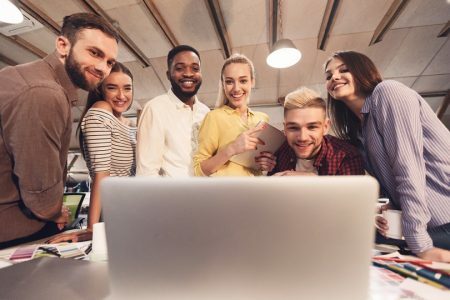 Although many businesses already invest heavily in professional events, events are often still relegated to second place when it comes to conceptualizing and optimizing marketing campaigns. In this post, I’ll explain why live events should be at the center of any good B2B marketing strategy. Digital marketers are used to securing only a few moments of attention from their target audience. Perhaps a prospect will glance at a paid ad, or take a few minutes to skim through a blog post. The best case scenario is usually that they invest an hour or so trialling a product, or speaking with a salesperson over the phone. Live events, however, provide marketers with an opportunity to craft a compelling brand narrative that lasts for hours, if not for days. 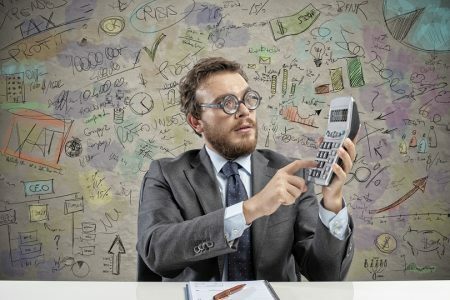 While it’s misleading to claim that event attendees are a captive audience – after all, they can always choose to duck out of sessions or focus on their smartphones – they will generally be more attentive to the message or value proposition being articulated than through other marketing channels. It’s no coincidence that when the most successful brands want to make a major announcement, they do so through a live event. Apple is known for crafting a compelling brand narrative through spectacular product launches. Salesforce articulates the company’s vision for the future at Dreamforce. Bizzabo hosts an event roadshow called Eventovation to share their innovative vision with prospects and customers. In order for marketers to create events that clearly articulate what a brand stands for, messaging must be agreed upon before the event is planned. Once finalized, the events team can think of ways to communicate this vision through overt and subtle means. Overt forms of communication can take the form of a keynote address from the company CEO, or via case studies shared by customers who successfully used the product or service to achieve an objective. Subtle means of communicating the vision can include the specific setting and design of the event venue, and the type of speakers and sponsors that are promoted on an event website or at the event. Some brands like Nissan create event experiences that exploit the five senses to communicate a brand voice – they actually spray a specially formulated scent inside of their trade show booths that is designed to evoke positive emotions from event attendees! Live events provide marketers with unique lead generation opportunities to collect new pieces of data about contacts before their event via event registration, as well as during the event through an event networking application, and after the event through polls and surveys. What’s more, the data collected from live events can be used to improve the performance of digital marketing campaigns. For example, if a marketer knows what sessions attendees participated in thanks to ‘session registration’ enabled event registration software, more relevant email workflows can be created that speak directly to the content preferences of event attendees. Live events also allow salespeople to form stronger relationships with their prospects. This is yet another reason why companies are turning to live events as a form of ‘sales acceleration’. 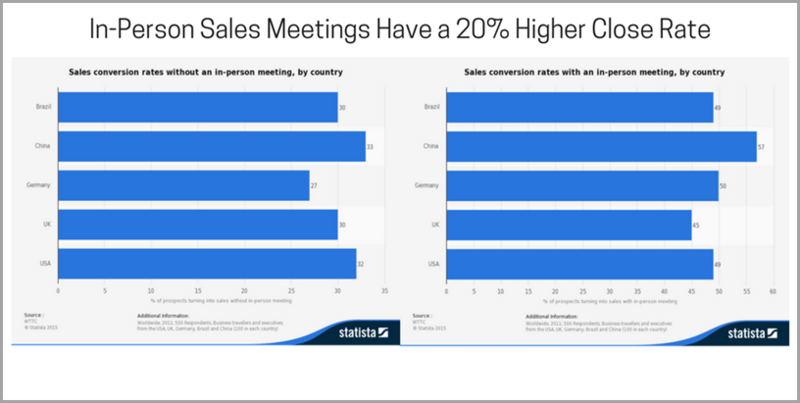 Deals that include an in-person meeting are 20% more likely to close than deals without an in-person meeting. Simply having prospects meeting with salespeople or product experts face-to-face can help build relationships faster than emails and phone calls alone. 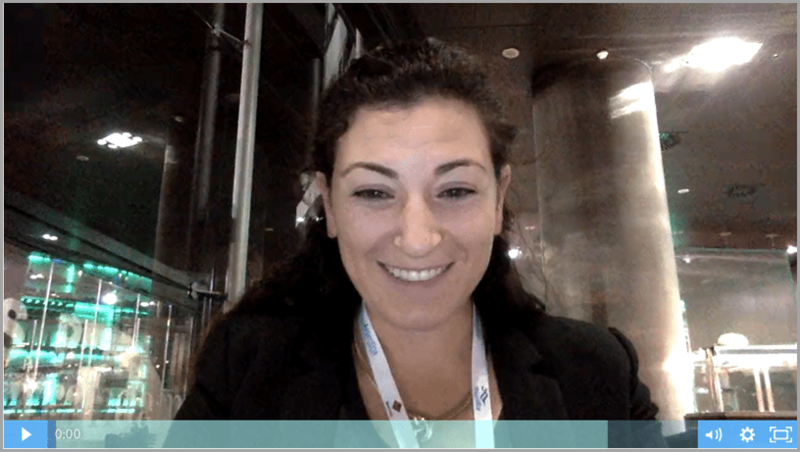 To further bridge the gap between digital and live event brand experiences, salespeople can also send prospects they met with at an event a recorded one-on-one video recapping the conversation. Tools like Zoom or Wistia can be used to quickly record and send video calls to prospects. An example of the one-on-one messages that Bizzabo sends prospects to recap live event meetings. While there was a time when live events could not be measured just like any other marketing channels, those days are long past. Marketers can now measure and optimize the performance of live events just like they can with other channels. The graphic below highlights the type of information marketers can gain access to with analytics tools like Google Analytics or using selected event management platforms. Each color in the image represents a unique marketing channel that sends visitors to an event website. Within each channel, we can see the most common type of behaviors visitors take. 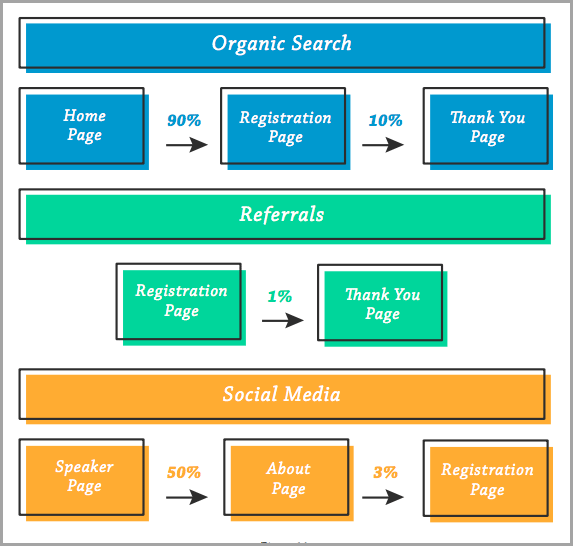 The graphic indicates that organic search is the most effective channel for generating event registrations. That’s because 10% of event website visitors successfully complete registration (which is why they make it to the ‘Thank You’ page). Conversely, referrals (that is, links leading to the event website from other websites) prove to be a weaker channel for generating event registrations, as only 1% of visitors actually complete registration. Visitors from social media don’t end up registering for the event at all, which is why they don’t make it onto the ‘Thank You’ page. Armed with this sort of information, event marketers can make an informed decision about whether they will concentrate on driving traffic from organic search as opposed to other channels in order to increase event registration rates. Today’s marketers have the ability to measure and optimize events, just as they can other campaigns, thanks to many developments in event technology. 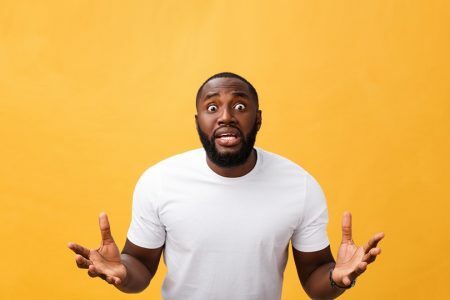 Events already account for a sizable portion of marketing budgets, but this does not mean that they currently play a significant enough role in the marketing strategies of most businesses. In order for events to play a more substantial role, marketers need to first pinpoint the biggest challenges they face. For some businesses, customer retention is a primary focus; while for others lead generation or building relationships with the media is key. Once objectives are defined, marketers can start crafting a campaign that begins with online marketing tactics to drive event registrations. The data collected from the event registration process and from the event itself can be used by marketing and sales teams to further improve digital campaign performance. 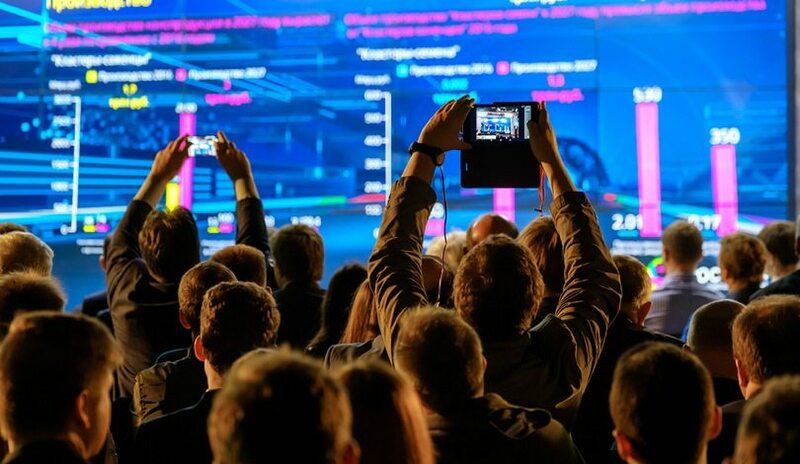 It’s time for modern businesses to make live events a priority and place them at the center of all marketing strategies. Guest Author: Alon Alroy is the Co-Founder and CMO of Bizzabo, the world’s fastest-growing event technology company. The Bizzabo Events Cloud is used by thousands of event organizers from around the world and was selected by The Event Technology Awards over 2 consecutive years as The People Choice’s Award for the Favorite Event Technology Solution.